Yesterday as we were walking to our car from church, we stopped to talk with a couple. When we had finished, Kate asked me who they were. I told her their first names. Before I could say the last name, she said their last name. Then she said, “My memory is shot.” She clearly recognizes what is happening. I hate for her to suffer in this way, but I think it will be even worse for me when she is not aware. At 6:00 last night, I went out to let her know it was time to come in so that we could go to dinner. She got up (she was on the ground) right away and started to follow me back to the house. I went inside. After 15 minutes, I hadn’t heard her come in; so I went outside and saw that she was working in a flower bed in the back of the house. It turns out that she hadn’t remembered that she was coming inside to go to dinner. She came in and took a shower. In a little while she walked into the family room dressed for bed. I asked if she had changed her mind about our going out to dinner. It turns out that she hadn’t remembered that. She changed, and we went out to eat. Last night while we were having dinner, Kate said, “You know, my memory is getting worse.” I told her I had observed that and noticed that she had seemed a little discouraged. I also told her that she had gotten along so well and that we were still able to enjoy so many things. She agreed. She also commented that although her friend, Ellen, knows, “no one else would know.” She went on to say that she still was not ready to tell the children. She also said she would know when it was time and that she would let me know ahead of time. I found this especially interesting in light of this week’s experience in which she accepted without any suspicion my awareness of her PEO meeting and plans for her to meet her PEO sisters for the trip to Sevierville. Clearly this lack of suspicion is a direct result of the progression of the disease. Last night I went to a dinner and auction in conjunction with a golf tournament sponsored by our foundation. I took Kate to Chalupas for a bite to eat before leaving. She had been resting in the bedroom since she had gotten back from her PEO meeting yesterday afternoon. That is quite unusual in that the weather was beautiful which meant it was a good time to work in the yard. While we were at dinner, she told me once again that she was ignored by the people she went with. I am afraid this is going to be a common experience. It is so sad. She wants to be a part, but I know that people can’t help it. They simply don’t understand. Last night at my dinner I told someone about Kate. She was shocked. She had only learned in the past week about the wife of someone else who has served with us on the foundation board. This means the circle of my acquaintances who know about Kate is gradually expanding. I can see that as the year moves along considerably more people will know. I just hope that there won’t be so many that Kate has the same experiences with them that she is now having with her PEO sisters. Today’s Kate went to her PEO chapter’s meeting. This was just a social and not a regular meeting. I had gotten an email reminding me of the meeting 3 weeks ago. Kate had also received an email (at least I assume so), but she had never mentioned it to me. In order to prevent her awareness that I am communicating with a couple of her PEO sisters about things like this, I simply mentioned this to her a week or so ago as though it were something that she might have told me. She never questioned how I knew. I reminded her yesterday that she would be going today. She asked me what time we were going but nothing else. I told her I was going to take her to our church where she would meet someone who would take her to the meeting. She showed no surprise that I knew this. When we arrived, she got out of the car while one of her sisters came over to speak with me about making arrangements to get her back home. I noticed that she didn’t say much to but gave me more attention as if to say that Kate doesn’t really understand, I’ll tell Richard. After they returned, Kate said that the people in the car are big talkers and that she had a hard time getting in to say anything. I suspect that what is happening is that people are beginning to treat her as though she doesn’t understand. In other words, they are treating her in the very way that Kate has been concerned about. That is why she hasn’t wanted people to know. Things like this make me feel for her. When she got home, she seemed tired. She has been in the bed ever since. Some of that time she has been working jigsaw puzzles on her iPad, but she has also slept. That is what she is doing now. I am about to get her up to take her to dinner. I have a dinner at the convention center this evening in connection with my responsibilities at the foundation. I think the social activity of the day has worn her out, another sign of Alzheimer’s. I think we are in good shape for the music club tomorrow night. We had someone put out all the mulch in all the flower beds. It looks much better now. The weather has put a little damper on Kate’s work in the yard. I am glad of that except that it provides entertainment for her. In fact, she really needs it. Over the past few months (even this morning) I have heard her mention being bored. I feel like we are pretty active, but the truth is there still is a lot of time during the day when she could be doing something. Since the Alzheimer’s doesn’t enable her to do the things she used to do, filling this time is becoming something of a problem. I did discover something that may help her. She gets tired and generally goes to bed as early as 8:30, sometimes earlier. I created a queue of old movies that I believe she would enjoy seeing, but she goes to sleep shortly after they start. What I have been doing is just showing the movie in segments over several nights. Even then, she isn’t really watching the movie. The most recent movie we watched is To Catch a Thief with Cary Grant and Grace Kelley, two stars she loves. One afternoon this week I asked her if she would like to watch the movie. She did, and we did. I think it was the first movie we have watched all the way through on a single showing. That filled up a good 90 minutes. If I could arrange for more movies, we would be in good shape, at least for a while. Of course, some of these would need to be streamed. One other reason I feel we are in good shape for the music club is that Libby came yesterday and helped us clean up the patio and garage as well as some of the other places in the house that she might have missed when she was hear Tuesday or things we had messed up since then. I also moved the furniture so that we are ready for the folding chairs that are to be delivered tomorrow afternoon. As we prepare for the music club at our house this coming Monday, I am coming even closer to adjusting to Kate’s inability or unwillingness to take care of some of the things necessary to get ready for entertaining. She has cleaned up the large guest room and the small guest room. I am not sure where she has put everything, but her office is still a mess. Although she had told me on Monday night that she would let Libby help her clean up, she refused to do so yesterday when Libby was here. As I reported yesterday, she was almost in tears when she told me we would just keep her door closed for the music club. I have let it go; I know everything will be fine. I was never concerned about the music club. I just thought it would be a good excuse to get cleaned up. I am more interested in the outside of the house now. I have arranged for hardwood mulch to be delivered today. I also contacted a young man to come over tomorrow and spread it in the flower beds. I have also asked Libby to come on Saturday help with some last-minute things like the patio and garage. A few days ago I had asked Kate not to do anything to mess up the yard after the woman who cuts our grass had come. She was here yesterday. I know that Kate will have forgotten and plan to drop it. I’ll just let her do what she is able and wants to do. That is working in the yard as long as she cares to do so. We bought more plants yesterday. She wants to go back for more today. She has planted a lot of what we have purchased but not all. I am slowly learning the lesson that I must learn and that is not to have any expectations that she will be able to do anything to prepare for events like this one. The disease simply won’t allow her. Of course, I have been doing this all along, but it is not something you just start doing. That is especially true since she is always trying to assert her independence and not accept any suggestions or help that I want to give. Increasingly, I am learning to let her do what she wants and can do. I can tend to the other things. One of the ways in which she is declining is not to notice things that are in front of her. For example, at dinner last night we split a shrimp and flounder platter. She said she was getting full. I noticed there were still two shrimp on her plate and asked if she were going to eat them. She said, “”Where are they?” I showed her. They were in plain sight. She wanted and ate them. When we returned home, I picked up the mail. There was a card from Ellen thanking us for taking her and her daughter to lunch for Easter. I left it on the island where I thought she would see and read it. Later I asked her if she had read Ellen’s note. She hadn’t; so I got the card and put it on her side of the bed while she was brushing her teeth. When I came back into the room, I asked if she had read the note. She said she hadn’t and asked where it was. I saw that it was on her bedside table; so she had picked it off the bed and put it there. She hadn’t noticed or felt any desire to read it. She had simply put it aside. This is a common thing that she does with email and regular mail. It is as if she doesn’t see these things which I do believe is part of it. Frequently I notice that she can’t see or read things that I point out wherever we are. It reminds me of the exercise I took one time at an Alzheimer’s workshop. We were asked to put on sunglasses in a dimly lit room and go from table to table trying to sort different items. I just couldn’t quite make things out. This was to give us an idea of what it is like to be an Alzheimer’s patient. Two days ago I finished a book. I still have a day or two before getting my new Audible credits; so I started listening to Jan’s Story. It is written by Barry Petersen who was a CBS journalist. His wife, Jan, had Alzheimer’s. I have listened to it twice before. At that time and now, I feel that it is really his story and not hers. Most of what he says tells more about his adjustment than hers. This time, however, I found myself more able to relate to what he says because I am experiencing some of the same things. 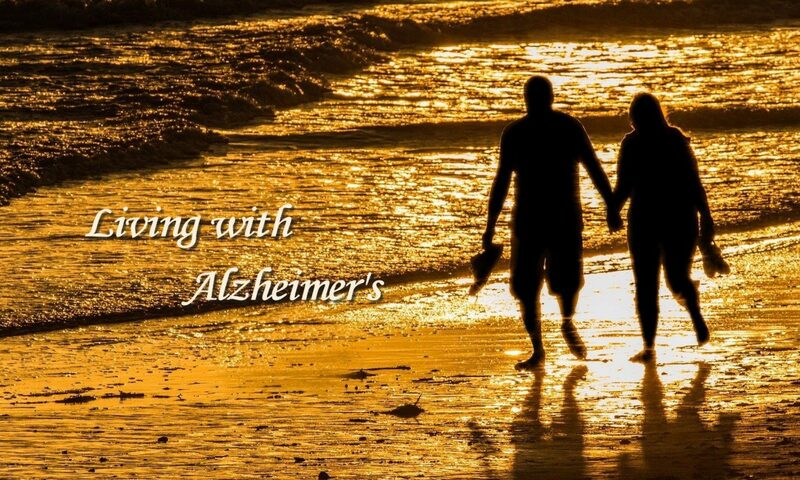 I also notice differences in their situation from ours in the same way that I have done when I have spoken with friends who care for a spouse with Alzheimer’s. All of this reminds me that as similar as we are, we are different as well. We are not identical. Wednesday afternoon (April 1) Ann and Jeff Davis were in town; so we arranged to meet them for dinner at Il Giorgioni at 5:30 pm They were not sure when they would be finished with a hearing at the State House; so they called when they got out to arrange the time. Kate was outside working in the yard. I went out to her and told her that the Davises had called and we would meet them in about an hour. She said she would come in to take a shower and dress. I came back inside. Knowing that we had plenty of time, I didn’t worry when she didn’t come inside right away. She did so in about 20 minutes. There seemed no reason to worry. When I saw that she was getting dressed, I still did not worry. When she wasn’t completely ready 10 minutes before I had planned to leave, I went to her to ask how she was coming along. She told me to leave her alone. I did. I didn’t want to start another panic attack. When it was time to leave, I checked on her again. She was indignant and again told me not to talk and leave her alone. Finally, we got in the car at 6:00, the time we were to meet the Davises at the restaurant. At 5:25, I called Ann and told her we were running a little late. After getting in the car, Kate asked what time we were to be there. I told her we were to have been there 30 minutes earlier. She then went into a panic and said she didn’t know. She wanted to know why I didn’t tell her. I told her I tried to explain but that she wanted me to leave her alone. This attack was not as severe as the last one, but she was still teary when we arrived in the restaurant parking lot. We took a moment for her to compose herself and went inside. She was very embarrassed about running late and felt it was her fault. She apologized to Ann and Jeff for being late. Just before the Davises left to go back to Nashville, Jeff said he wanted to go to the men’s room. I said I needed to go as well. In the men’s room I told Jeff about Kate’s Alzheimer’s and explained that is what accounted for our being so late. Yesterday afternoon, I called Ann and apologized for telling her through Jeff and wanted to give her a little more information. She was quite tearful throughout the conversation and had me tearing me up near the end. She wanted to know what they could do. I told her it would be nice if we could come up to have lunch with them sometime in the near future. She mentioned that they are coming through on the way back from North Carolina next week and could have dinner with us. I told her that would be great.